The method is perfect when accuracy demands are moderate, for example to connect information on ground measured trees to a laser scanned air measuring operation or to follow up individual trees on sample plots. 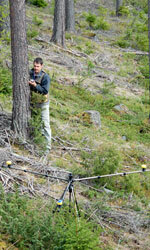 Postex and the Digitech Professional caliper form a complete system to measure and position trees. Three distances are transferred through Bluetooth or IR to the Digitech terminal where register is made along with details on specie, diameter, heights and other variables for each tree. When calculating the position, consideration is made to the tree diameter, to make a correct position of the tree center. The new PosTex Laser makes it easier to measure distances and heights of individual trees in the plots. With the combination of ultrasound and laser, you are free to select measuring method depending on type of vegetation and distance, giving an increased user area and improved efficiency. With laser technology, there is no need to disassemble the PosTex transponders, and distances and heights are simply measured. The Postex instrument is one of several instrument solutions based on the Vertex Laser Hypsometer. Built-in Bluetooth transfer and beep signal and a user friendly interface are all details from the Vertex Laser. With three adjusted transponder T3 placed in a triangle on the custom tripod, individual trees can be position set with the Postex instrument. Ultrasound seeks the shortest way around any obstacles and will work also in dense terrain. This is why Ultrasound technology is preferred by foresters around the world.